A federal court has ordered the Trump administration to stop issuing permits for fracking in federal waters off California's coast. It's a huge win for sea otters, whales and many other species. The order is the result of three lawsuits filed by the Center for Biological Diversity, Wishtoyo Foundation, the state of California and the Environmental Defense Center challenging the federal government's approval of offshore fracking in the Pacific Ocean. "Stopping offshore fracking is a big victory for California's coast and marine life," said the Center's Kristen Monsell. "We're glad the Trump administration lost this round in its push to expand dangerous oil operations off California. This decision protects marine life and coastal communities from fracking's toxic chemicals." Responding to a suit by the Center and partners, a judge just ruled that the Trump administration violated basic laws in approving a permit for Keystone XL. The court blocked construction, ordering the feds to revise their environmental review. This decision is a new setback for the controversial tar-sands pipeline. TransCanada, the company behind it, hasn't yet announced whether it'll finally get built if all needed permits go through. 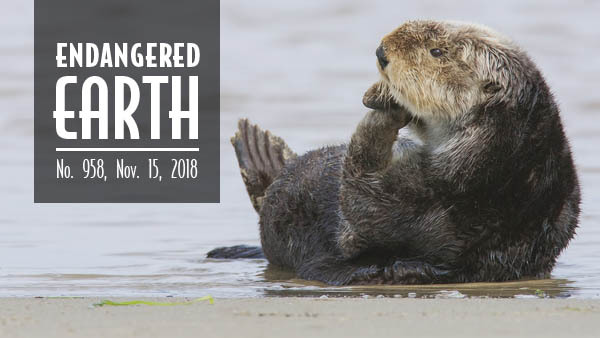 "This is a complete repudiation of the Trump administration's attempts to put oil-company profits before clean water and wildlife," said Jared Margolis, a Center attorney. "Keystone XL would devastate species and pollute communities. We need to move away from fossil fuels now." The clear springs of northern Alabama are the last refuge of spring pygmy sunfish. Urban sprawl and industrial farms have destroyed many of these clean creeks, endangering the tiny fish. Now the good news: Following legal action by the Center, the U.S. Fish and Wildlife Service made a plan to protect this species' habitat and is now accepting your comments. Take action: Urge the Service to save the sunfish's last home. The Center sued the Trump administration Wednesday for violating the Endangered Species Act by failing to make a comprehensive recovery plan for gray wolves across the country. Our lawsuit comes as the Fish and Wildlife Service plans to remove protections from nearly all gray wolves in the lower 48. That would make wolves vulnerable to trophy hunting and trapping. "We won't let Trump bring wolf recovery to a screeching halt to benefit the blood sport of trophy hunting," said the Center's Collette Adkins. "If it's successful, our lawsuit will require the feds to recover wolves nationwide and block their efforts to prematurely remove protection." Read more in the Duluth News Tribune and consider donating to our Trump Resistance Fund. On Wednesday the Center unveiled the 18th installment in our national Endangered Species Mural Project. 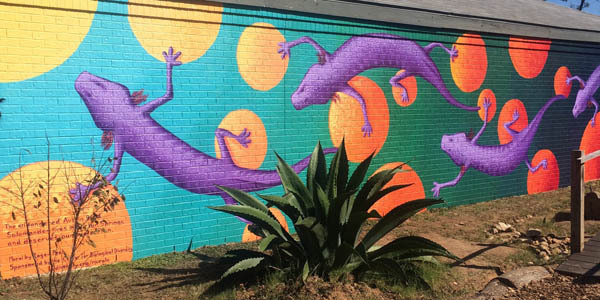 The 25-foot mural in Austin, Texas shows two local amphibians: the Austin blind salamander and Jollyville Plateau salamander. It was painted by artist Roger Peet and students from Austin Discovery School. What do fracking and plastics have in common? 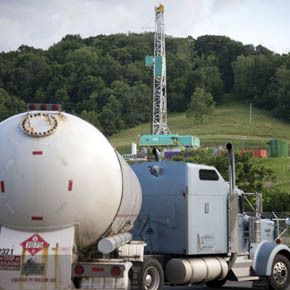 Fracked natural gas has become a cheap, plentiful raw material for making plastic and other chemicals. Now the petrochemical industry plans to vastly expand U.S. manufacturing. More than $200 billion is earmarked for factories, pipelines and infrastructure. In some places construction is already underway. Read more in The Revelator and sign up to receive the Revelator's weekly e-newsletter. The Center has filed a legal motion to dismiss Cliven Bundy's latest lawsuit to seize more than 58 million acres of Nevada public lands, including national parks and monuments. Bundy seeks to have the lands transferred to the state, which never owned them. "Bundy has illegally grazed cattle on 800,000 acres of public lands for two decades, racking up over a million dollars in fees and fines and trashing critical wildlife habitat," said Kierán Suckling, the Center's executive director. "This case would be laughable if Bundy and his followers weren't armed extremists with a violent history." 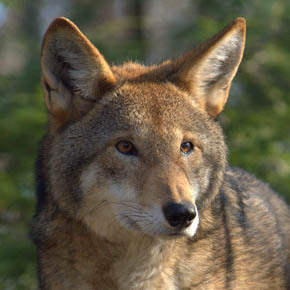 Trump's Interior Department has been blatantly ignoring the plight of Earth's last wild population of red wolves. Then it declared that landowners could shoot and kill them. That was not only abhorrent but, as a federal judge has just ruled, also illegal. "Wildlife are not the property of landowners," wrote Chief Judge Terrence W. Boyle. "[They] belong to the public and are managed by state and federal governments for the public good." A recent Guardian article features the United Nations' head of biodiversity, Cristiana Pașca Palmer. Palmer says world conservation targets for saving species must be set by 2020. Compared with climate change, biodiversity loss gets little public attention. But it's a crisis that poses just as great a threat to human existence. 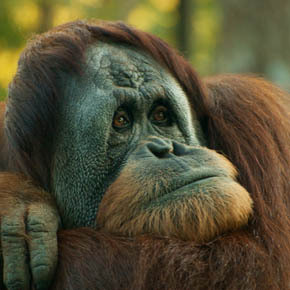 We urgently need to act — on a global scale — to avert mass extinction. 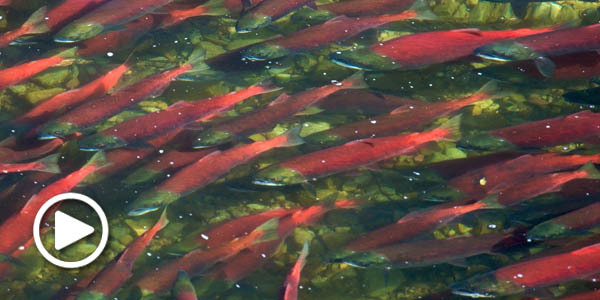 The death of thousands of Pacific salmon can be a boon. After their hard-fought migration from the ocean to the upper reaches of streams where they hatched — a journey of hundreds of miles or more — all Pacific salmon die. Then their bodies become a gift to the river ecosystems. Readily available proteins these fish brought from the nutrient-rich ocean are transferred to nutrient-poor streams. Other animals, and even streamside trees, benefit from salmon carcasses as they decay. See what a life-giving Pacific salmon graveyard looks like on Facebook or YouTube. Photo credits: Sea otter by Alan D. Wilson/Nature's Pics Online; whooping crane by NaturesFan/Flickr; spring pygmy sunfish courtesy Alabama Department of Conservation and Natural Resources; wolf pup courtesy ODFW; endangered species mural by Noelle Bell/Center for Biological Diversity; liquefied petroleum gas truck near fracking well in West Virginia by Tara Lohan/Center for Biological Diversity; Gold Butte National Monument in Nevada courtesy BLM; red wolf by Valerie/Flickr; orangutan by Justin Miller/Flickr; salmon courtesy NPS.